Her first jammies on the night my life truly began…. 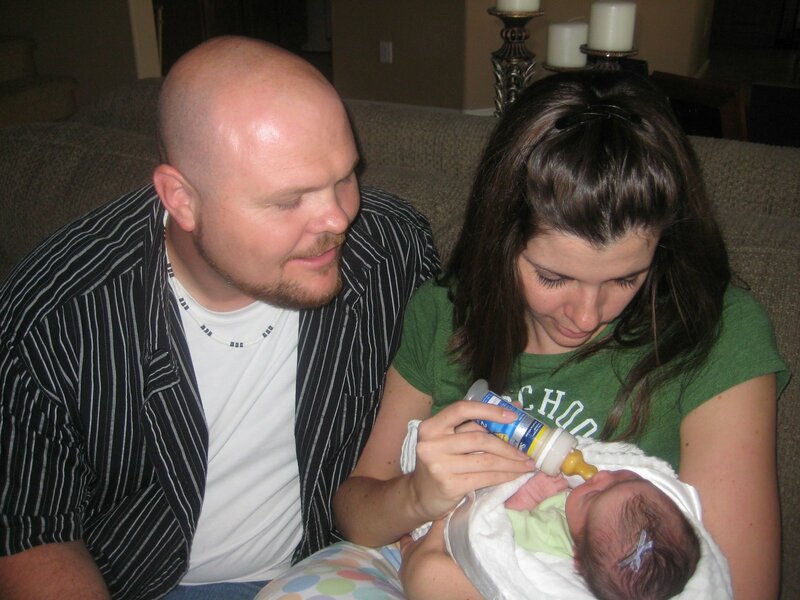 Our first feeding with our daughter…. Things have been absolutely mad around here, as you can imagine. I’ll give the full story in time, but here is the shortened version. Saturday at 1 pm we got THE CALL from SW about our little girl. She was born Thursday morning 4 weeks early and her birth parents(truly amazing people!) had chosen us(that morning). We met with them at 6pm and by 9pm they asked us to be her parents. 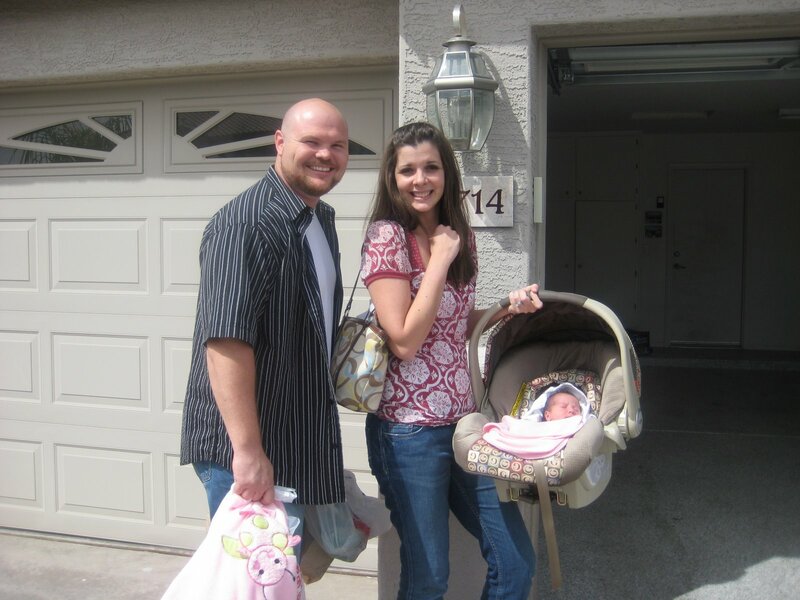 The next morning (73 hours after her birth- 72 is min for AZ) the TRPs were signed and 23 hours after we learned she existed, our daughter was strapped in her brand new carseat in the backseat of our car as we drove her home!! Our neighbors were standing outside and flipped when they saw us pull a carseat out of our car….and then there was a steady stream of people (up to 18 ppl at once) coming to meet her all afternoon. We are so blessed. This process is truly an amazing thing. One a few short days ago I was feeling very down in the dumps about adoption. The words that I read, the words I layed out and the feedback that I received from all of you is, what I believe, the last thing I needed before I was ready to be a mom to this girl (well, except for someone to come clean my house. Any takers?). I can’t tell you how much I used the info/advice/experience in this post to help build what I hope will be a solid, healthy, lifelong relationship with R’s birthparents. It is funny though. On Sunday, I didn’t feel happy at all (I had only gotten about 2 minutes of good sleep Saturday). I mean, my head was happy, but it was so surreal. Even when she was in my arms, in my own home, I didn’t believe it. It was all so fast and there were so many people here!! It didn’t have time to sink in and I couldn’t process it all. She didn’t feel like my daughter quite yet (she is starting to now, more and more every day!). When I told my work Monday morning, it finally hit me and I broke down crying. This is for real. This is what I have been waiting my whole life for. This is who I am. So now we are bonding. Trying to spend as much time just staring at her as possible. Loving life, trying to soak it all and wrap our brains around this parenting. We’ve had lots of firsts already, including our first trip to the ER (she is doing fine- upper respiratory infection, but we passed our first parenting test!). More about that later…. I am completely overwhelmed by the outpouring support!! In my heart I know this is truly meant to be and I am so thankful to have all of you along for the ride! Categories : Open Adoption, R's story, R.
Congratulations! I love her name and she is beautiful! I cannot wait to hear more of her story. oh bri ~ I am SO happy for you!!! She is absolutely beautiful! I LOVE her name ~ Riley was on the top of my girl list during out wait. :)I know the first several days are so overwhelming….especially when it happens this fast! It wasn’t until about the 3rd week that I felt like I started REALLY getting the hang of things and feeling more comfortable with meeting his needs. :)You and your hubby look SO happy and you all make such a beautiful family! I can’t wait to hear more ~ but I know all too well what you are experiencing right now and I know there is minimal time! 🙂 I’m not sure where you are in the valley, but if you need anything please let me know! 🙂 At some point we should plan on meeting up! :)Congratulations!!!!!!!!!!!!!!!!!!!!!!!!!!!!!!!!!!!!!!!!!!! I am so excited for you! What a little bundle of blessings! Soooo thrilled for you guys!!! WOO-HOO!!!! I am SOOO HAPPY HAPPY for you all, when I read todays blog and saw the pictures I had happy tears:) What a story, you all are truly blessed, and what a beautiful baby girl you have. CONGRATULATIONS and God Bless!!!!! what a beautiful name for a beautiful baby that is now part of an amazing family!!!! it’s real now!!! how completely amazing. i have been in such a fabulous mood for the past two days- simply overjoyed for you. I just couldn’t be happier for you! Thank you for sharing her name (beautiful) and the photos. You are a beautiful family and I am absolutely thrilled for you that your miracle finally arrived! I was also thinking back over your last few posts and how fitting it was that you got all of that sorted out just before your daughter came into your life. Funny how things work out! Beautiful name for your beautiful daughter! Congrats again! She actually looks like YOU. Remember that even birthmothers don’t always feel that connection or bond at first- give yourselves time if it isn’t happening just yet.WOW- I am just stunned and so excited for you guys. She is absolutely beautiful. I LOVE the picture of all three of you in front of your house and the LIGHT in your eyes! What a beautiful family God has pieced together! Yay! Beautiful! Y’all look so happy! I’m so happy for you!!!! So…so very happy for you!!! Congratulations on your beautiful, little miracle! She is precious… perfect! I can’t stop thinking about you and Riley, and of how God works in the most mysterious ways! Please keep us posted on how things are going and how you are adjusting! Many of us have so much to learn, and so much to look forward to. Will keep all three of you in my prayers! Beautiful name for a beautiful girl. Congrats again! This post made me cry – I am so happy for you! Your story is very similar to ours – the details are different, but the plot is very much the same. So happy for you and your new daughter is so beautiful!!! Enjoy every minute (even the sleep deprived ones!) Thank you for sharing her with us!! Ok. I’m crying. I’m soo soo happy for you both. She is so tiny and precious. Beautiful name for a beautiful girl and a beautiful family. congratulations!! I love her name! CONGRATULATIONS! WOW! WHAT A WIRLWIND EXPERIENCE! At least I had a few months to prepare….crazy….the lack of sleep was the hardest for me! God Bless! SO excited and happy for you guys! She’s adorable, and I’m sure you guys feel whole now. Enjoy every second of the coming days and weeks with your precious little girl! Bri~I have enjoyed following your journey for months and was SHOCKED to see this!! Wow. You are just beautiful, and so is your little girl. I’m sure you want to pinch yourself! Happy Birthday to sweet Riley. My daughter is also a March birthday! Looking forward to seeing pics of her in her nursery, something I’m sure you have waited for forever!! Amazing how this just ‘happened’ although, it didn’t…did it?!! It took a long time and a lot of ‘stuff’ to get here! !So happy for you!! So glad it all worked out this way!She is gorgeous!! Great name!! !No problems being early?? That is great!!! She so beautiful! Glad she is with her mommy and daddy where she belongs. You guys make an adorable family. I’m so happy for you! Bri, I am so very happy to read your news! I was away this weekend and had no idea until I was reading Reggie Boppy’s blog! Congratulations to you and your husband! You make a beautiful family!!!! Your head must be spinning (in a good way) Enjoy:) Makes me realize how fast this really could happen…. Bri- I am so happy for you! This happened so fast and I was so surprised and thrilled and elated to see this post and I am so excited to see you gorgeous little girl! Congratulations!!!!! Bri, she is absolutely adorable. I love the name! Isn’t it amazing how one week you feel all the pain about infertility and the next week you have a beautiful daughter in your arms? I am so, so happy for you!!! And girls rock!!! She is perfectly beautiful, and I love the name you chose. I know what you mean about it taking awhile to sink in. When the nurse and G were wheeling Evie’s bassinet into our hospital room 1/2 an hour after she was born, what was going through my mind was pure shock. I remember thinking that I wasn’t being happy enough 🙂 I’m glad your visitors have calmed down and you’re taking time to bond now! Congratulations again! oh my, what a wonderful story and what a beautiful little girl and name! enjoy each other! Congrats! Strap in, you are going to love this ride… I am so excited to hear more about your new baby girl. She looks precious. Congrats Bri – she is beautiful! Enjoy every moment! Riley is the baby you were meant to have all along. It’s a miracle how they find us! She is absolutely beautiful. I’m crying just reliving the night we brought our daughter home. It was surreal and I think we were both in shock for about a week. And we had 2 months notice! I can’t imagine how crazy it must have been for you…adoption is amazing!! We all have our own incredible stories and it’s so wonderful to experience them all. WELCOME HOME RILEY! Yea baby pictures!!! I am happy for you. Congratulations! I know how those whirl-wind matches work and it is so surreal to be waiting for a baby one day to actually holding your child in your arms the next day. It does take a bit of adjustment! Enjoy this time and bond, bond, bond. You cannot spoil her…enough!!! :)Blessings to you and your new family! OMG! OMG! Bri, I am so, so happy for you! Wow, what a whirlwind that led you to your daughter! She is beautiful…enjoy every minute! Congrats to the three of you! I couldn’t figure out why I wasn’t seeing a post from you and then I realized Duh! I had moved you to my ‘Forever Family’ folder already.I love your daughter’s name. She adorable and both look thrilled. I had to wipe tears away while reading your post. I’m so glad that she came so quickly and you didn’t have to wait for her to be born. Let it take time for you to truly feel like her mom. When you do it will be GREAT. Love every second of it.Oh and I love how you surprised your neighbors. Very cool story to tell R one day. Oh my goodness! She is so gorgeous. I am thrilled for you guys and am praying for you after your above post. Keep us updated and know you’re being thought of and prayed for! Just stumbled upon this blog and want to say… you guys are TOO ADORABLE! Bless you all! I am so happy for you (even if I don’t know you).